I had to fix a hole in our bathroom wall. The towel rack had pulled out leaving a hole; so I set about to fix it. Unfortunately, I am not a handy person. I did my best, but when I pulled the towel off the newly hung towel rack it pulled right out of the wall again…leaving an even bigger hole. I followed the directions printed on the patch material I purchased. I asked the staff at the hardware store. With every “repair,” the hole grew larger. “One last time,” I thought. “I’ll try one more time.” So I stood at the store staring at the display of materials for patching a wall. I tried to reason through my experience to figure out my next step…my last step. An employee offered his explanation. I didn’t have the heart to tell him, “Already tried that…made the hole bigger.” After he left, another shopper said, “Hey buddy.” (I always wonder if something shifty is coming when I hear that.) “What that guy said…it won’t work. 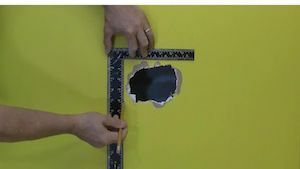 It’ll just make a bigger hole.” I knew that! He had my attention and continued, “I do this for a living and I’ll tell you exactly what to do.” He spent the next five minutes explaining how to fix the hole in my wall. He even drew a few simple diagrams. I went home with renewed hope and followed his instructions to the letter. The towel rack supported by the repaired wall is now the most secure towel rack in the bathroom. I could not have fixed the towel rack and the hole in the wall without the help of that man. He met me at my level of knowledge and taught me. He gave me guidance, introducing ideas and concepts while remaining responsive to my questions. He was friendly and patient. I tell you all this because I learned four very important lessons about effective parenting from this one interaction with my “construction mentor.” Let me explain. The man waited until the employee had left and then spoke with me one-on-one. He was sure to have my full attention and he did not try to “correct” my difficulties in public. Effective parents also teach in private. Rather than “correct their children in public, they move to a private place and speak to their children one-on-one. They make sure they have their children’s full attention and speak to them one-on-one in a calm and respectful manner. The man saw my need for help patching a hole in the wall and hanging a towel rack. He didn’t just explain how to fix the hole in the wall but how to fix the hole AND make the spot strong enough to hold the towel rack. He didn’t teach me how to fix the toilet, either. He simply addressed the need I had at the moment. Effective parents meet their children’s need “at the moment.” When their children begin to whine, they explore the need rather than simply yelling at them for whining. There will still be time for teaching, but find out what your children need first and then respond to that When responding to your children, let them lead you to their need rather than deciding what they need. The man taught to my level. He even drew simple pictures I could take home with me. Those pictures really came in handy for my limited skill set. Effective parents meet their children at their children’s developmental level and skill ability. They do not expect a four-year-old to understand what a 12-year-old does. Nor do they assume their 12-year-old knows how to do something just because they’re twelve. Instead, effective parents teach their children how to do what they want done. They teach keeping the level of their children’s ability to understand in mind. The man allowed me to ask questions and made sure I understood his instructions. He trusted me to do the job after I had received his instructions. Effective parents allow their children to ask questions and effective parents trust their children to do the best they can. A trip to the hardware store and a fallen towel rack resulted in my learning how to fix my wall and, more importantly, four great lessons to put into practice as a parent. Give these four tips a try with your children. They may end up being the most secure children on the block.